At the Nijubashi, in front of the Imperial Palace in Tokyo. What a wonderful week we’ve had! From the top floor of the Aeon mega store, looking out over Tokyo to Shinjuku. The week started off with a visit for me to a “mega store” – think Target, but instead of one floor the store takes up seven, starting with a huge grocery store on the ground floor, and finishing with several restaurants on the top. The store literally sold everything – you could buy what you need for dinner, pick up some socks and underwear, get your hair cut, and plan your own funeral before choosing a restaurant for lunch. Our daughter-in-law bought some new socks and pants for the kids, and some school lunch supplies, and then we enjoyed a tempura lunch on the top floor as we chatted and looked out over the city at Shinjuku’s skyscrapers in the distance. 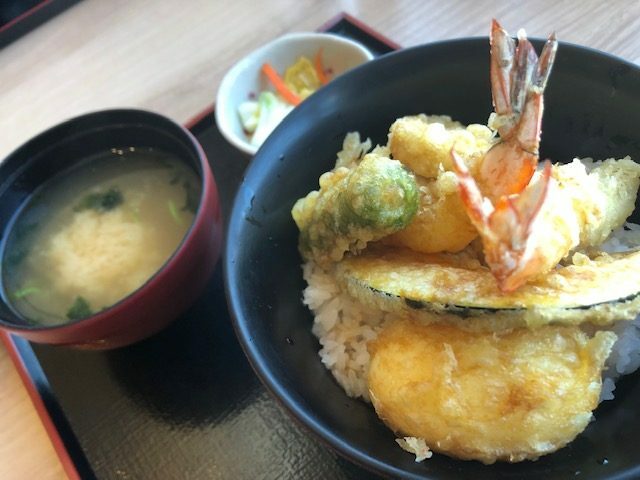 Tempura shrimp, egg, and vegetables over rice with miso soup and pickles. 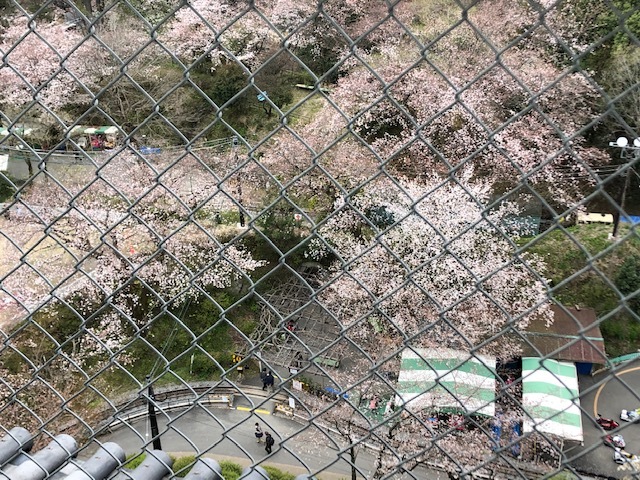 Monday was the beginning of spring break throughout Japan, and Brett and I met our grandson at a large park close to our house in the afternoon and watched him at the skatepark for a while and then brought him home with us for dinner and a sleepover. 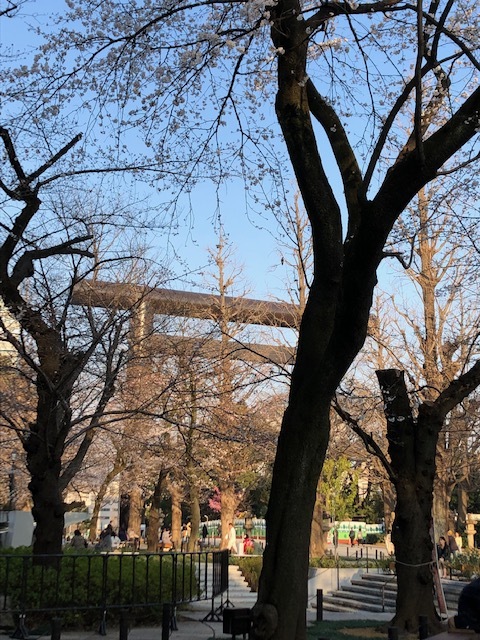 Tokyo can seem at times to be nothing but a sea of concrete, but there are all sorts of wonderful parks, both large and small, throughout the city with all sorts of activities and attractions. 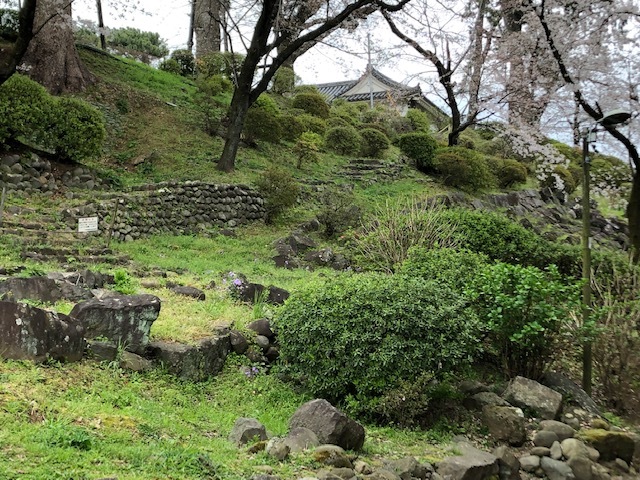 Setagaya park, just a 15 minute walk from our apartment, has several sculptures, walking, jogging and cycling paths, a full-size steam engine and rail car to explore, a playground, a miniature train ride through the park, and another (very popular) play area created completely from recycled materials. On Tuesday afternoon Brett and I went out to visit the Imperial Palace and the Yasukuni Shrine in central Tokyo. 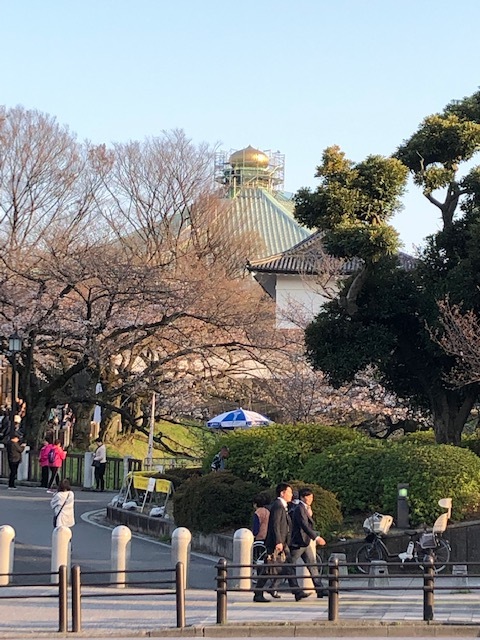 We strolled through the East Garden of the Palace to view the cherry blossoms, and walked from there to Nijubashi, the double bridges that lead up to the palace. 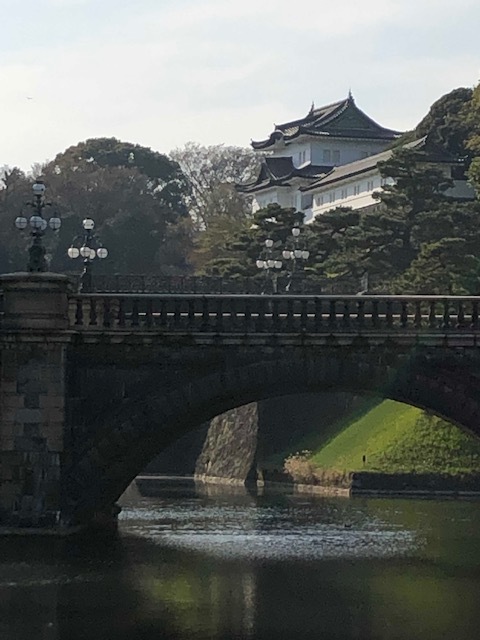 Visitors are only allowed to visit inside the palace grounds as part of a reserved guided tour, or on December 23 (the Emperor’s birthday) or January 2 (New Year’s). On the last two dates visitors are handed a small paper flag when they enter to wave as “banzai” is shouted three times when the Emperor and his family appear (we got to do this two different times when we were stationed here). The palace grounds are quite large though, so the distance between the garden and the bridges required quite a bit of walking. We have a real appreciation now for the distance our son walks each year for his Imperial Challenge fundraiser. Entrance gate to the East Garden of the Palace, the only area open to the public. Part of the palace can be seen from outside the Nijubashi. Afterward seeing what we could at the Palace, we walked across the street to view the Dai Ichi building, which served as General MacArthur’s headquarters during the U.S. occupation of Japan following WWII. The building was considered huge at the time, but these days it’s dwarfed by the skyscrapers that surround it and tower over the building. We then took a short train ride over to see the Yasukuni shrine and the Budokan. We were feeling very tired and hungry at this point though, so only viewed the outer walkway and small memorials outside of the main shrine complex before deciding to come back to see the main shrine on another day. Yasukuni is the memorial shrine for war dead who served the Emperor during wars from 1867–1951, and fourteen Class A war criminals, including those like General Tojo, are enshrined there, which has caused controversy from time to time. The shrine also has a museum that is a must see, so Brett and I are looking forward to returning when we’re not so tired and have time to take it all in. The Daiichi (Grand) Torii at the entrance to the Yasukuni Shrine. The shrine celebrates its 150 anniversary this year, and work was going on all over to get everything updated. The Irei no Izumi memorial is a spring dedicated to those who suffered from or died of thirst in battle. The Budokan, a huge indoor arena built for the 1964 Tokyo Olympics and later home to many famous concerts, is located across the street from the Yasukuni Shrine. The highlight of the day though was meeting author Susan Spann, who helped us when we couldn’t figure out which exit to use after we arrived at Ōtemachi station. She has written a series of novels set in the Edo period of Japan (1603-1868) that feature a samurai (who is a shinobi 忍び – similar to a ninja. It’s my Japanese word of the week; I only knew about ninja). He works with a Portuguese Jesuit priest to solve murders. Susan is currently writing a book, Climb, about her experiences climbing mountains throughout Japan. I am reading the first in her series now, Claws of the Cat, and am having trouble putting it down – I’m already looking forward to the rest of the series. Another happy offshoot from our conversation with Susan is that Brett is going to begin taking Japanese calligraphy (shodō) lessons this week! Susan told us about her experiences and recommended an instructor, so when we came home he contacted the school and signed up. He’ll do five lessons and be able to take his first examination before we leave Japan. If he enjoys it, there are shodō classes available in Portland and he can continue through the summer before we leave for England. 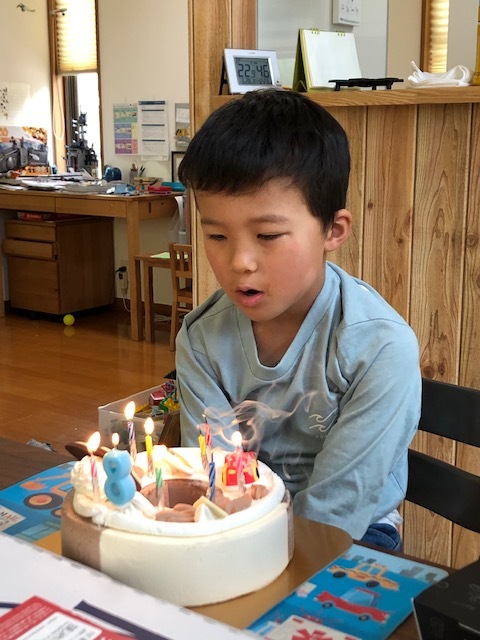 Blowing out the candles on his 8th birthday! We had pizza and birthday cake with our grandson on Thursday for lunch before heading out on the long ride to Narita to meet Meiling and K. Their flight arrived on time, we got them their round-trip tickets to and from Narita and made the long ride back home, went out for a quick bowl of ramen, and then they promptly collapsed as they’d been awake for nearly 36 hours! They’ve been having a grand time since though and have gotten around on their own to visit Akihabara (anime and geek stuff) and Shibuya, view cherry blossoms, and went out for a wagyu beef dinner on Saturday. Yesterday our whole family (well, minus WenYu and YaYu) got together for the fabulous Sunday brunch at the New Sanno Hotel, and then afterwards we went with Meiling and K to the Meiji Shrine followed by a walk down Takeshita Dori in Harajuku to check out the 100¥ store and eat crepes. 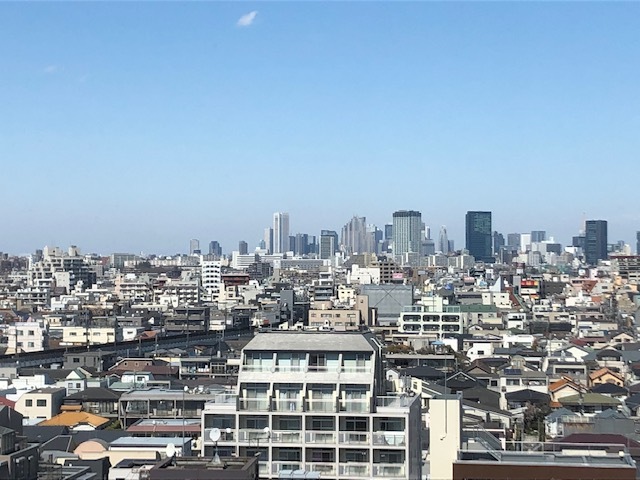 This morning we’re going with them to Asakusa to visit Sensōji temple, and then they’ll continue on their own to Ueno Park because we have to get back for our first day of picking up the grandchildren from their respective schools. Meiling and K will attend an immersive art experience tomorrow and then will fly back to the U.S. on Wednesday. Early Friday morning Brett and I left with our son and family for an overnight birthday/anniversary getaway in Odawara, located on the coast just southwest of Tokyo. 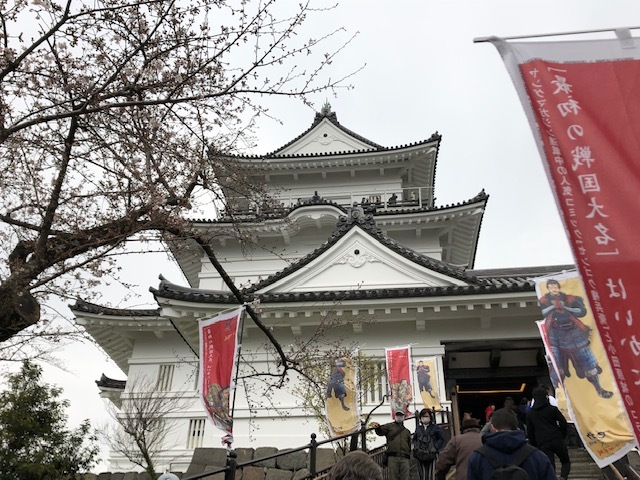 We spent the morning touring Odawara Castle, the 7th largest castle in Japan. 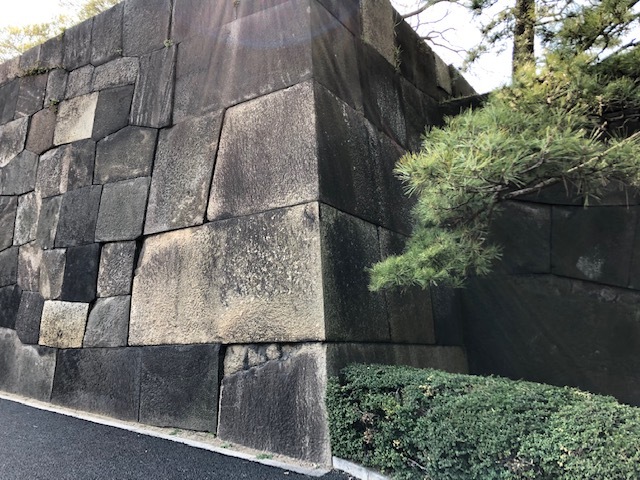 It was originally constructed during the Edo Period (1603-1868), but was severely damaged during the Great Earthquake of 1923, with the remainder destroyed during WWII. It was rebuilt following the war using the original plans and now holds exhibits of items discovered during archeological digs on the castle grounds, and visitors can also climb to the top for spectacular views of the surrounding area. 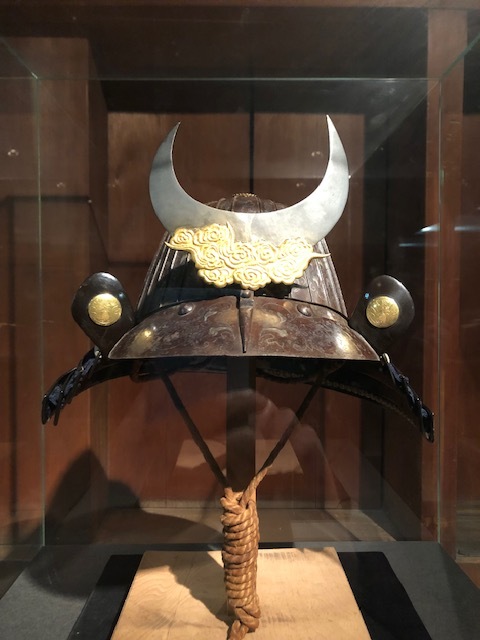 There is also a wonderful exhibit of samurai armor that we enjoyed. Exquisite decorative work on a samurai’s helmet (kabuto). 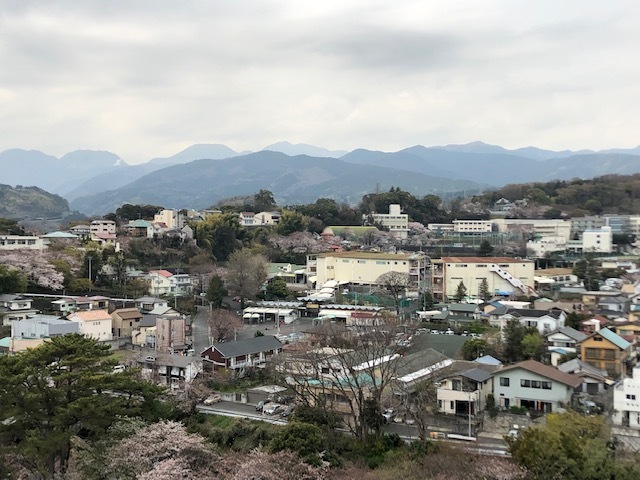 Looking out over Odawara from the top of the castle to the mountains north of the city. 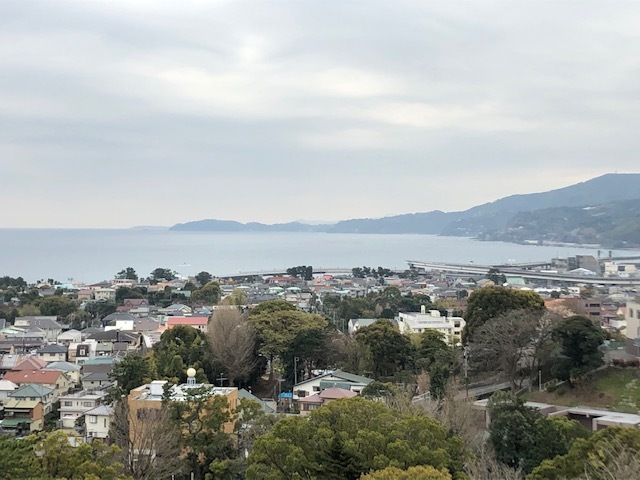 To the south, the view from the castle top takes in Sagami Bay, Ōshima Island and the Izu Penninsula. Pieces of the original castle foundation slid down the hill during the 1923 Great Earthquake and have been left where they stopped. Today marks the halfway point of our Japan stay – we have another six weeks to go before it’s time to head back to the U.S. for the summer. We have another busy week coming up as we put on our grandparent hats and pick up the grands every from school so our DIL can begin her new job. Other than today’s visit to Asakusa, Brett and I plan to stick close to our neighborhood this week. We discovered there’s a Muji store just a couple of blocks away so we’re going to check that out. On Saturday we’re going to Tokyo Disneyland for the day, a surprise trip for our grandson for his birthday. We’re looking forward to that outing, and to again see what’s the same and what’s different with Disneyland over here. We are ready for a new year! 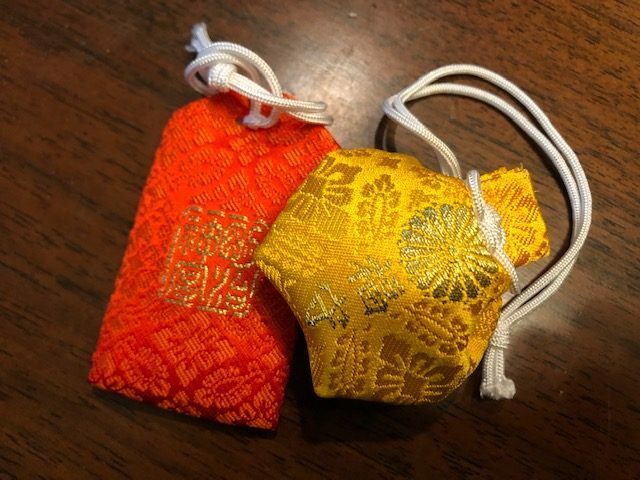 Brett and I each got new amulets for good luck (red) and fortune (gold) at Meiji-jingu. The shrine had a special area where we could thank and get rid of our old amulets. 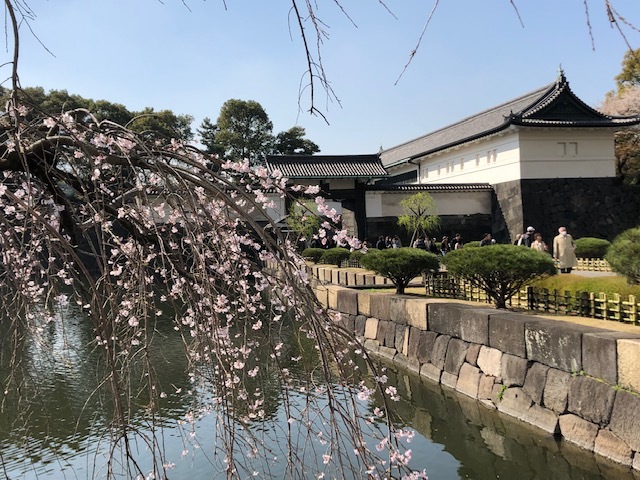 A tree in full bloom at the Imperial Palace. Cherry trees in various stages of bloom. Looking down from the top of Odawara Castle. Mono no aware: the transience or impermanence of things. Cherry blossoms are already beginning to fall, and soon they will be gone, until next year. I’ll be taking one more week off and then will be back to more regular blogging. Thank you for sticking with me – I hope you’re enjoying some beautiful spring weather these days! What a wonderful and busy week. I can’t believe your grandson is 8. Time goes so quickly. Really enjoying the pictures. The dessert buffet looks fabulous. Congratulations on your anniversary. It was a wonderful week, but we are exhausted and looking forward to a little less activity. I never thought I’d feel grateful for having to stay home and do laundry, etc. Time has really flown by – it seemed like it was just a short while ago that we flew over here to meet him for the first time. And the years with Brett have flown by as well. What a great time you guys had! The photos are lovely. Both Brett and you look very happy and young; congratulations to both of you on your anniversary. Love the story about the dessert buffet. Thank you for the compliment! We don’t feel very young these days – cold weather and LOTS of stair climbing have made our joints ache, but we’re still happy to be here with our family and in our favorite country. Love all the pictures, especially the one of you and Brett at the Imperial Palace. Congratulations on your big anniversary! Love the family pics, too. Your grandson looks so grown up in that BD pic. 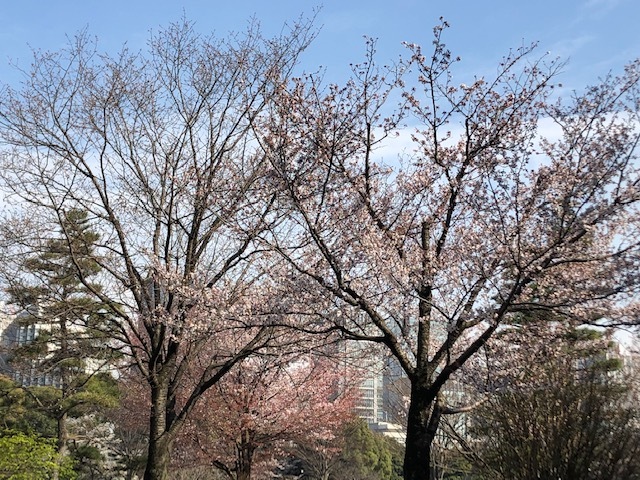 The cherry blossoms are beautiful – great that you are there at the right time to see them. The dessert women really crack me up, but looking at the options, I can see why they’re excited. 🙂 Your posts are making me want to visit Japan. With the advent of selfies, etc. it’s difficult to get someone to take pictures of us together, but a Japanese couple our age stepped up and offered. I’m happy the picture turned out well – the glare looking that direction was awful, so not sure what the woman saw on the screen. 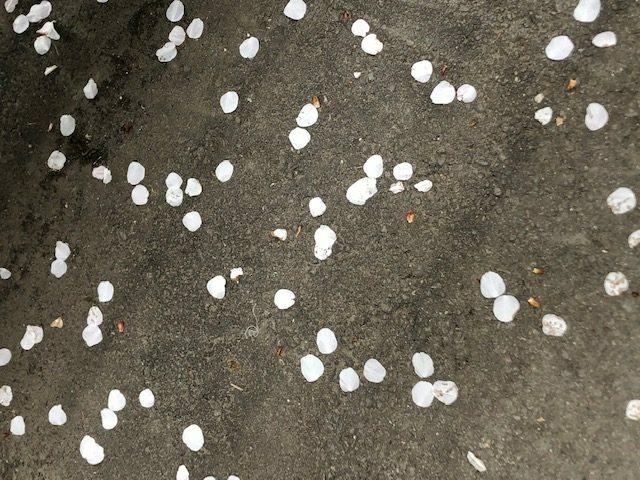 The cherry blossoms have been magnificent – it’s sort of hard to understand what the big deal is about them until you see them. They are everywhere, and so, so beautiful. The desserts on my plate (pavlova, bread pudding, roll cake, shortcake, panna cotta, and strawberry daifuku) were less than half of what was offered. There was also a white chocolate fountain with marshmallows. Nothing here is too sweet though, but we were still full enough that evening that we skipped dinner. It was a fantastic week! I am so hoping you can make it over here one of these days when we’re here so we can get out and see and do things together! I was sad to not be able to come this year. We were trying for April but it wasn’t in the cards, and then my girlfriend suddenly died, sending us all into a tailspin. But there is still a group of us who want to go together so I’m hoping that will happen. Several of them are Japanese so it would be really special for them! First, I offer my condolences on the loss of your friend. I know how tight you and your group are, and I imagine tailspin doesn’t even begin to describe how you and others felt and are feeling. We will be back in Japan next year, at least for a month, probable mid-September to mid-October. The location we’re staying this time is wonderful, and our host owns three apartments in the building, so if you think it’s something you and friends want to do next year, I can contact her and try to arrange for us to all be in the same apartment building! 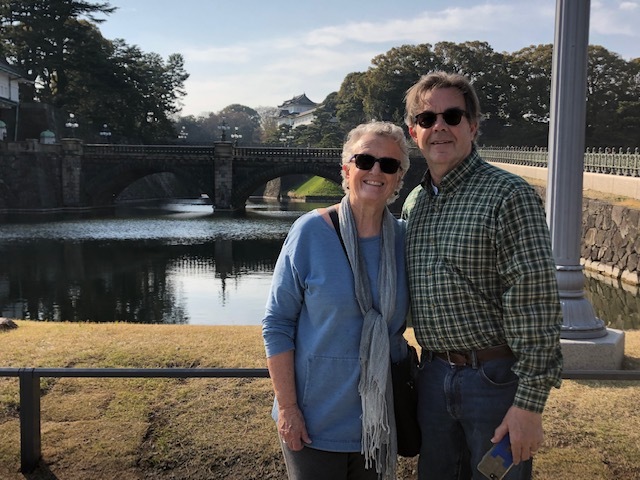 So glad you’re enjoying the time with your beautiful grandchildren and in Tokyo. Love the cherry blossom photos. 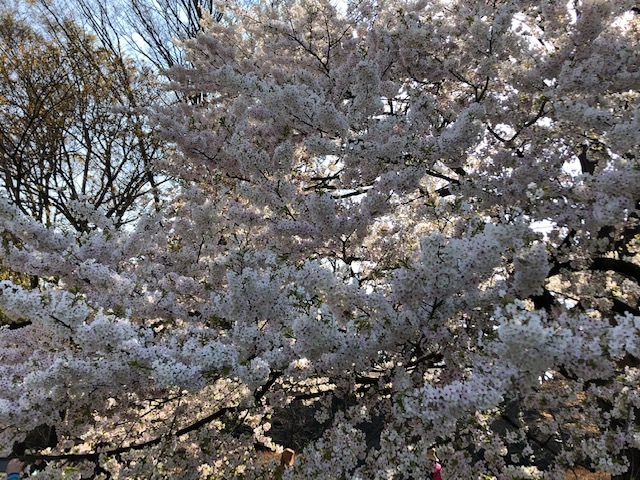 Almost 30 years ago I was in Tokyo when they were blooming — amazing! 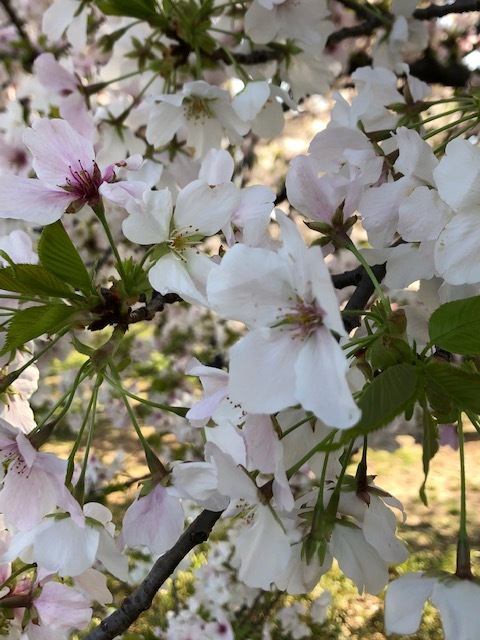 And I just returned from a work trip to Washington DC last night and this past weekend the cherry blossoms there were at peak, I was so grateful to get to see them. Enjoy the next six weeks! We are having such a good time with our grands, and are enjoying picking them up from school each day. I’m especially gratified that our 2 year-old granddaughter and I have already become best buddies – she chats away with me in Japanese, I speak English to her, but we seem to understand each other perfectly. I am so happy to be here while the cherry blossoms are in bloom – it’s even better and more beautiful than I remember! So glad our daughter got to experience them as well. Thank you for posting the photos! Love the cherry blossoms. What kind of cake did your grandson have? 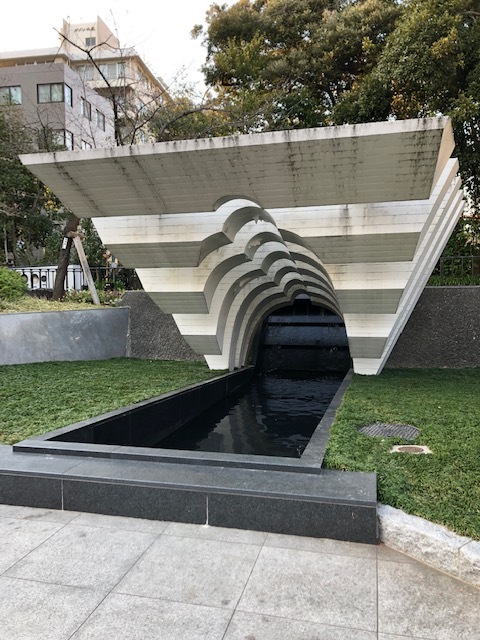 It looks like there is a hole in the middle, but it’s hard to tell. The cherry blossoms just keep on coming – peak bloom was supposed to be last weekend but they are still blooming like crazy in most places. Thanks! I’ll have to see if I can find that cake around here. Just returned from the cherry blossom festival in Washington, DC. We were very fortunate to be there on a beautiful day and the blossoms were in full bloom! The cherry blossoms in D.C. are positively gorgeous – now just imagine them everywhere! That’s what it’s like here. We are so grateful we got to see them this year. I imagine the cake is a Japan thing (the ice cream is different here too – no where near as sweet as it is in the U.S.), but I haven’t been in a U.S. Baskin-Robbins in years, so don’t know for sure. What a busy week, but am enjoying following along! Those cherry blossoms must have been so beautiful in person, as the photos are lovely. The cherry blossoms in Japan are one of those things that have to be seen to be believed. They’re gorgeous in photos, but in reality are absolutely breathtaking – it’s hard to describe. Every day I see some trees that are just amazing. I am especially in awe of the big, old trees that have been carefully tended for years – they’re magnificent! You’ve brought the travels to life! And made me want to go back to Japan. I’ve only visited once. A short work trip. So much to see and so interesting. We are having the best time here! You really should come back – there are so many layers to be discovered in Japan. It’s never boring, and there are so many wonderful things to see and experience, from the magnificent to the mundane.